Our gun in the park and the two in the Bay City park were brought here during the winter of 1904-1905 from Mare Island navy yard in California. Our gun was placed in the park May 29, 1905, and dedicated on July 4, 1905. Congressman George A. Loud and our local Postmaster at the time, James Buckley, are credited with obtaining these guns for Michigan. The metal tablet on the carriage of many of the Dahlgrens in Michigan explain about the gun and the Hartford. These plaques were cast at the Industrial Works in Bay City. Farragut, Hartford and Dahlgren were entwined in the naval battles for New Orleans, Port Hudson, and Vicksburg as they were in the battle for Mobile. The union losses during the battle of Mobile were heavy; 52 killed and 170 wounded. The battle for Mobile Bay was the hardest fought naval battle of the Civil War. The Hartford alone out of a crew of 310 had 25 killed and 28 wounded. She had been hit 20 times. Five shells pierced her hull. Four crews of the big Dahlgrens had been blown to pieces. The dead and wounded were quickly removed, the guns repaired and the firing resumed. In its entire Civil Aware history the Hartford was hit 264 times, but Farragut was never hurt. He wrote his wife: "Though I am worn out with mental strain and physical fatigue, I escaped—thank God—without a scratch." He was made rear admiral in 1862, vice admiral in 1864 an da full admiral in 1866. His fame was built on only six hours of actual fighting. "Don't be afraid of doing too much; those who are, seldom do as much as they ought." He told his men. The last time the Dahlgren 1X-inch guns were fired in anger was in the battle for Mobile Bay. shell gun, is easy to ignore. But this gun with its enlargements was called by a naval historian " the gun that won the Civil War." Navy men came to regard it as the most efficient boat weapon of its day; Dahlgrens " stood well" in battle. spongers, tackle men, 16 in all, plus one powder monkey, a young boy, to fire each broadside gun, Dahlgren's uniformity of gun size and their munitions was a great advantage, especially in an intense battle. gun. One of, John Dahlgren's earliest inventions was an improvement of the percussion lock. The large metal loops were for the strong ropes used for running the guns out and for checking the length of the recoil when the gun was fired. The casabel block on the rear of our gun is reversed with the concave side to the rear. It should be turned and it's pin made flush with the upper face of the casabel so the rope will pass through smoothly. The iron Marsilly carriage, much more durable than a wooden carriage, is No. 110, weighing a hefty 1,290 pounds itself. Wooden carriages (probably of elm), if hit during battle, could splinter. Wounds from these splinters were serious and even fatal to the gun's crew. The lighter iron carriage was possibly exchanged for the heavier wooden one after the Civil War in the late 1860's when the Hartford was refitted. Iron carriages held up better under the force of the recoil and while heavy, were lighter than the massive wooden carriages. The large circles, holes in the sides of the iron carriage, were to further lighten it. Originally the Marsilly carriage had four wheels, but the newer designs had only two wheels, a truck, so the rear of the carriage slid on the deck, checking recoil. To move the gun a large handspike was used to lift the carriage so the wheels could be maneuvered. Appropriately the Dahlgren faces the waters of Little Traverse Bay. This piece weighting 9,085 pounds, two or three times the weight of a car, with its side projections, its trunnions, resting on the carriage, was a naval gun. On the en of the right Turin is the date the cannon was cast, 1859; on the left trunnion is a letter "P" for "proved" with the inspector's initials, "W.R.T. for William Rogers Taylor. Dahlgren was unusually involved with the correct casting and safety testing, the proving, of his guns During the Civil War when his new and even more powerful XV-inch., was placed in an ironclad's turret in spite of his protests that his newest weapon had been insufficiently tested and perhaps poorly cast, he instructed the crews to fire the XV-inch gun only when absolutely necessary and to load only a reduced charge. In the past gun crews often felt the possibility of the gun bursting upon firing made it almost as dangerous to shoot as to be shot at. Dahlgrens, though, were handled by the crews "with as much confidence as they drink their grog." No Dahlgren gun, not the 1X-inch or the XV-inch, ever burst, even when fired with full charges. By the end of the Civil War a battery of twenty-six 1X-inch Dahlgrens were on the deck of the Hartford. The Hartford's Civil War battles at New Orleans, Vicksburg, Mobile Bay and Port Hudson established the ship as one of the most valuable unarmored vessels of the conflict Gun crews called the type of gun in our park a black power gun or "the soda water bottle." John Dahlgren did not like the nickname for his gun. The 1X-inch is the result of his long struggles with the navy to change the practice of adapting army guns for navy use. Our gun was the first of a whole series of Dahlgren naval guns. Across the bay in Harbor Springs' Zorn park is another Dahlgren 1X-inch from the Hartford. Harbor's gun is No. 678, cast in 1862, weighing 9,061 pounds. Cheboygan has one on a carriage in front of its County Building. Three more are in the Marina Park at Mackinaw City, mounted on metal carriages. These three are elevated with their muzzles pointing skyward. One of the three had previous; been in the Fort Michilimackinac grounds but was moved during the fort's renovation because the gun was not from the fort's period in history. Hedges almost surround the three carriages at the waterfront setting. 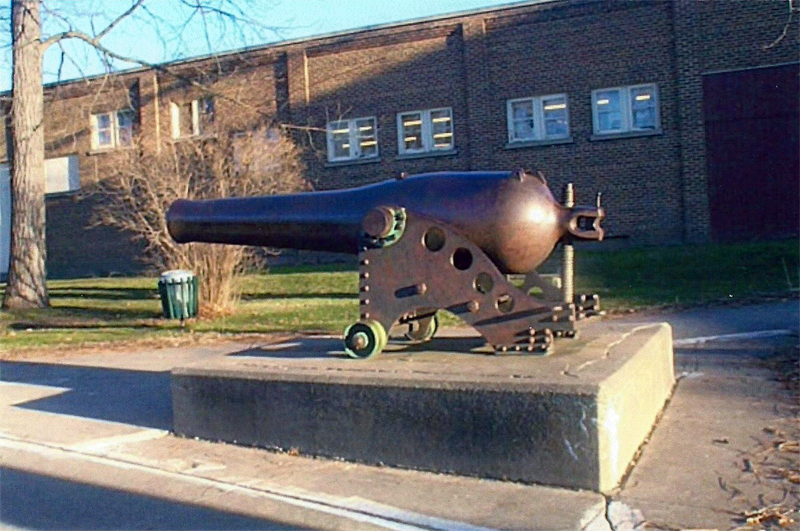 All these Dahlgren guns except the ones in Petoskey and in the yard of the City-County Building in Gaylord were cast during the Civil War years. Gaylord's gun is No. 250 from the same foundry as the Petoskey Dahlgren. Two more 1X-inch Dahlgrens from the Hartford were placed in parks in Bay City. 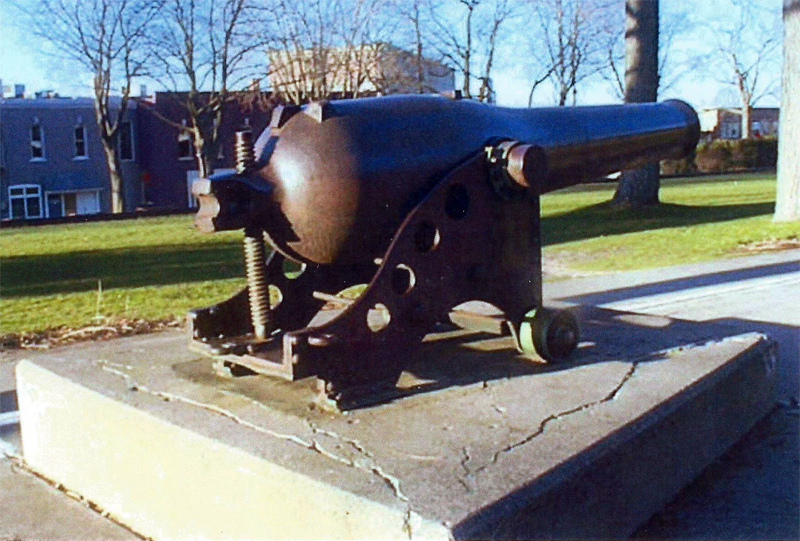 The Civil War gun in the Veteran's Park in Boyne City is a land artillery piece, a Columibiad on a metal Barbette Carriage, which may have been mounted on a pivoting mechanism. We are lucky to have these relics from the Civil War in Northern Michigan. In Bay City during World War 11 historic cannons, city streetcar rails and other steelwork were gathered up during patriotic scrap drives. Some believe that the cannons were too large to be used for scrap and may still exist buried in some junkyard. In trying to track down the location of all the Dahlgren' s from the Hartford it was learned from the Naval Archives that unfortunately the records of the gun's relocations are lost. Perhaps some other of the 1X-inch guns were collected for scrap during World War 11. Maybe a few are in other locations in the United States. The power of this seemingly ornamental fixture quietly resting in our park was dreadful. During pre-war trials in 1852 the shell from our 1X-inch Dahlgren hit a target of white oak 30 thick at a range of 1,300 yards. The explosion displaced 27 cubic feet of wood Think of a cube made of yard sticks to visualize the approximate destruction. When fired at ironclads the 1X-inch shell could pierce 4.5 inches of iron plate backed by 20 inches of solid oak. The inventor of the gun in our park by painstakingly crafting the best cannon possible for naval warfare with wooden ships prepared the U.S. Navy for war with the more formidable ironclads.